Built in 21pcs LED lights,which is intelligent to OFF/ON by touch sensor switch. 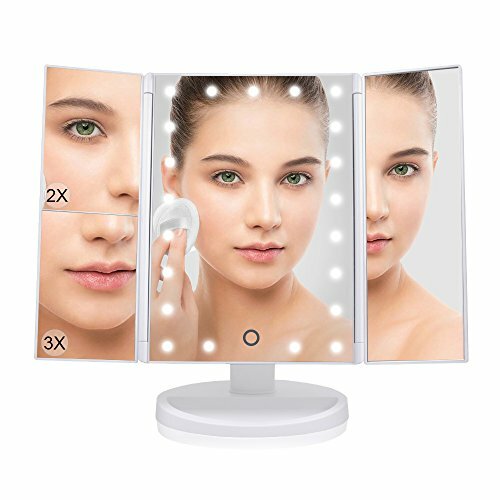 Three panel and trifold design with 1X/2X/3X magnification mirror. Powered by 4*AAA batteries and USB charging. (battery not included, usb cord included) The mirror cannot store power itself. 180 degree Rotation and base recess can hold cosmetics and jewelry such as earrings, bracelets. 1.This mirror cannot store power itself. You need to keep connecting the USB cord when there is no batteries in. You can use the USB charging at home and batteries in situations out of electricity. 3. Before touch the sensor switch to turn the light on, please make sure the ON/OFF button located on the back of the mirror is in the ON position. 4. Turn to OFF position before storage. Controlled by touch sensor switch, turning LED lights on/off whenever you want. With intelligent adjustable light, press and hold button for several seconds,you can dim the lights. Three panel and trifold design with 1X/2X/3X Magnification provides wide-angle viewing. Open or fold it like a book when not using to protect it away from the dust or scratches. 180 degree Rotation: fix at any position to give you the perfect viewing angle. Base recess can hold jewelry or cosmetics, watch, earrings, bracelets, etc. 100% SATISFACTION GUARANTEE: you can have peace of mind. If for any reason you're not completely happy with your purchase- if it breaks, if it's damaged in shipping, or even if you change your mind - simply let us know and we will either replace it or refund your money, your choice! If you have any questions about this product by DreamGenius, contact us by completing and submitting the form below. If you are looking for a specif part number, please include it with your message.